President Franklin Delano Roosevelt waves from the inaugural stand on Capitol Hill in Washington on Jan. 20, 1941. In a discussion with historian Douglas Brinkley about his inaugural address, President-elect Donald Trump reportedly mentioned speeches by John F. Kennedy and Ronald Reagan. President-elect Trump is busy these days with victory tours, Cabinet-making and foreign policy tweets. But he&apos;s also finding time to think about his inauguration. He huddled this week with presidential historian Douglas Brinkley, who later told CNN they had discussed the inaugural addresses of previous presidents. Brinkley emerged from the tete-a-tete at Mar-a-Lago resort in Florida to say Trump was not planning a stem-winder on Jan. 20. "He doesn&apos;t want it to be long," Brinkley told CNN. "He doesn&apos;t want people standing out in the cold." In other words, Brinkley added, he doesn&apos;t want to be like William Henry Harrison, who in 1841 gave the longest inaugural speech ever (an hour and 45 minutes in a snowstorm) and served the shortest time in the White House, dying of pneumonia one month after the speech. That disaster aside, the inaugural address has become a major feature of a new presidency, thanks in large part to the mass media of the 20th century. But at the very beginning, the remarks were delivered not to an adoring throng of supporters but a gaggle of congressmen and other officials. "Among the vicissitudes incident to life no event could have filled me with greater anxieties than that of which the notification was transmitted by your order, received on the 14th day of this month." Some of that humility persisted four years later when Washington penned his second inaugural address. Just 135 words, it remains the shortest inaugural to this day. 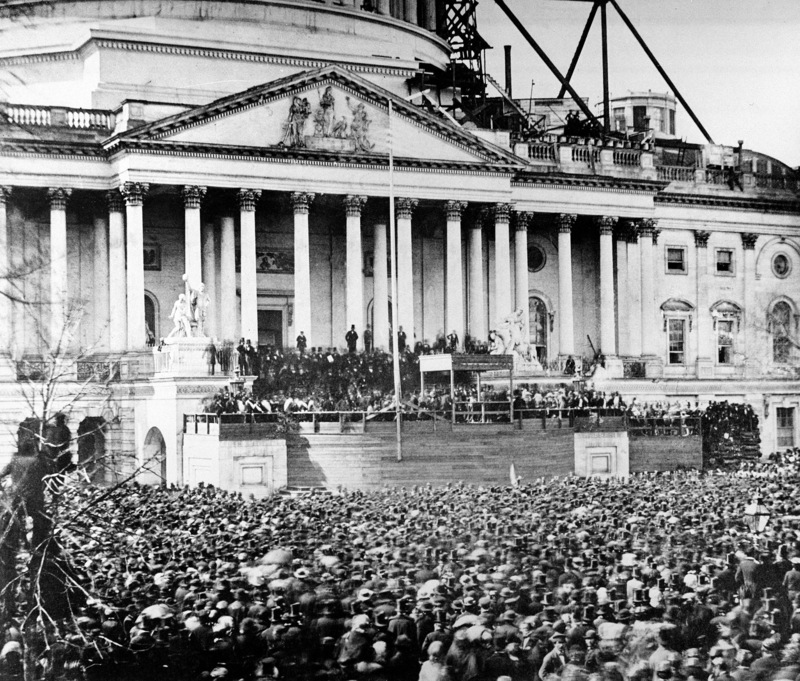 The inaugural addresses we often remember best were those delivered at the worst times in our national history. Most everyone has heard at least some of the speech Abraham Lincoln worked for weeks writing in 1861. With war between the states looming, the new president tried desperately to slow the spread of disunion. "We are not enemies, but friends," Lincoln concluded. "We must not be enemies. Though passion may have strained, it must not break our bonds of affection. The mystic chords of memory, stretching from every battlefield and patriot grave, to every living heart and hearthstone, all over this broad land, will yet swell the chorus of the Union, when again touched, as surely they will be, by the better angels of our nature." Stirring words to be sure, but not successful. Secessionist forces would fire on the federal Fort Sumter in South Carolina the next month, and four years of civil war would follow. In the depths of the Great Depression in 1933, Franklin D. Roosevelt tried to translate his landslide election into new confidence for the nation as he intoned the words: "The only thing we have to fear is fear itself." Roosevelt went on to decry "nameless, unreasoning, unjustified terror which paralyzes needed efforts to convert retreat into advance." And he added a note of hope: "In every dark hour of our national life a leadership of frankness and of vigor has met with that understanding and support of the people themselves which is essential to victory." FDR himself found a great deal of support, winning re-election three times. But the depression lingered through the decade and was only surmounted with the onset of World War II. President Abraham Lincoln stands under cover at center of Capitol steps during his inauguration in Washington, D.C., on March 4, 1861. No president has taken the oath in such dire circumstances since, but several inaugural addresses have been regarded as pivotal. According to Brinkley, Trump himself mentioned the speeches by John F. Kennedy and Ronald Reagan. "Let the word go forth from this time and place, to friend and foe alike, that the torch has been passed to a new generation of Americans — born in this century, tempered by war, disciplined by a hard and bitter peace, proud of our ancient heritage ..."
Moving as those words were, they were eclipsed by the exhortation that came after: "And so, my fellow Americans, ask not what your country can do for you. Ask what you can do for your country." A generation of his fellow Americans would do just that, in the military, in the Peace Corps, and in countless other forms of public service. Few may have realized at the time, but Kennedy&apos;s shining words were not entirely his own. Roosevelt and other presidents had depended on staff and advisers in composing their speeches. But with Kennedy there emerged the speechwriter as star in the person of Ted Sorensen. Sorensen had joined Kennedy&apos;s team in 1953, the year the future president entered the Senate. Sorensen had been raised and educated in Nebraska, but he had an immediate rapport with the scion of the Harvard-bred Kennedy clan. The self-effacing Midwesterner would have a hand in nearly all Kennedy&apos;s most famous utterances – including the book Profiles in Courage, for which the senator was awarded the Pulitzer Prize. "Let&apos;s just say that my work over an 11-year period with John F. Kennedy was a collaborative process, and I would not remember now who provided one word or one line. But John F. Kennedy was the author of his inaugural address because he&apos;s the man who made the decisions on what policies and values to enunciate." In Reagan&apos;s later years, one of his writers gained considerable profile in her own right. Peggy Noonan would also write major speeches for the first President Bush. Noonan went on to be a newspaper columnist, as did Michael Gerson, who gained a measure of fame writing for the second President Bush. Among Democratic presidents, Bill Clinton and Barack Obama were known for their way with words. Obama in particular rose to national prominence as a speechmaker. But both also had numerous writers with whom they worked. Which brings us to the present day and the case of President-elect Trump. Brinkley reported that Trump told him he&apos;d started working on his address and planned to produce it himself. But his transition team has said he is also working with Stephen Miller, a former Senate staffer for Alabama Republican Jeff Sessions who has been on the Trump campaign staff for more than a year. At 31, Miller is a year younger than Sorensen was when Kennedy took the oath. Raised in Southern California, he came east to attend Duke University before coming to work for Sessions. Like Sorensen, Miller is very much a policy adviser as well as a wordsmith — motivated by the immigration issue in particular. Miller often spoke at Trump rallies during 2016, whipping up the crowd with harsh attacks on Hillary Clinton before Trump stepped on stage. He is also credited with drafting the acceptance speech Trump gave at the Republican Convention in July, a speech widely regarded as an indictment of life in the current U.S., a dark description of the nation&apos;s economic, social and cultural condition. But Miller is also said to have provided the prepared remarks Trump sometimes used on the stump in the fall — remarks that kept the candidate "on message" and minimized self-generated controversy in the campaign&apos;s final days. If Miller is indeed a major contributor to the Trump inaugural address, which Miller is likely to shine through? The crowd outside the West Front of the Capitol that day will be larger than any Trump rally to date, with tens of millions more watching around the world. And the Trump transition team has said the tone of the day will be uplift. Whatever the tone or the message, history tells us the first day of the Trump presidency will be remembered largely for the words the new president speaks.